On Friday the Transportation Safety Administration (TSA) awarded City Chemical LLC a contract to provide 510 bottles of 500 grams (255 kg / 116 pounds) of Potassium Chlorate for $21,746.40. The chemical is used in making a high explosive, amongst other things. 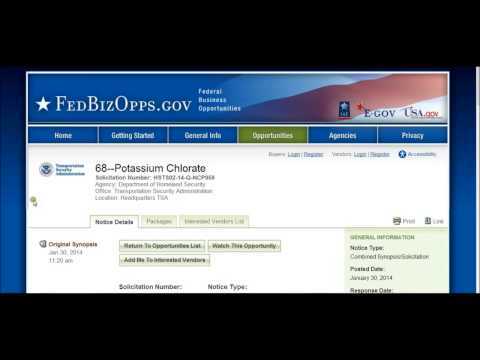 Potassium Chlorate (KClO3 ) is used to form an explosive material known as a Sprengel explosive. When mixed with a plasticizer, it may become high explosive, requiring a blasting cap (generally a commercial #8) to detonate properly, and is considered too unsafe for most uses. It is also used to generate oxygen by gentle heating. Peter Wolpert, the president of the City Chemicals Corporation in Jersey City, testified that he filled three large orders for urea, nitric acid, sulfuric acid and other chemicals to make a high explosive in the 1993 attack. Mr. Wolpert agreed to testify only after being granted immunity after invoking his 5th Amendment right to self-incrimination. Wolpert and others gained to earn the FBI’s reward for the arrest and conviction of the suspects. In 2005, a New York jury ruled that the Port Authority of New York and New Jersey was negligent in the 1993 World Trade Center bombing, yet in 2013 another court ruled that the Port Authorities were protected by governmental immunities. The purchase of a high explosive, and other questionable items, is not new for the TSA. In September 2013, the TSA allocated nearly 1 billion dollars for the purchase of explosive storage magazines. 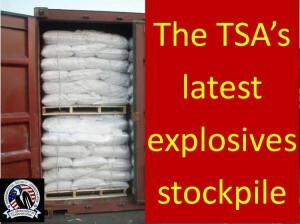 In August 2012, the TSA purchased 1,400 pounds of high explosives, the same ones as used in the Murrah Federal Building bombing in 1992, and the CEO of the company was a former TSA director. It can be said of many things about the TSA, but buying explosives in a time of financial hardship across America is the least prudent purchase they can make. Will Congress ever ask why? You should be. Contributed by James Smith of Prepper Podcast Radio Network. James is a father of four and grandfather to four cute little bugs. He and his wife Beautiful Gorgeous, of almost 30 years, have been prepping since 2003. They live in a small town, with neighbors as close as 10 feet away and have raised chickens for 3 years covertly on less than 1/5 of an acre. When his wife discovered he had chickens (about 2 weeks after he bought them) she nearly left him! However, his charm won her over to them, although she does not interact with them. He is the host of The Covert Prepper Show heard on Saturday evenings. All shows can be heard and downloaded from the Prepper Podcast Radio Network.